Almost certainly the weakest cruiser in the game; at least you get it for the price of a destroyer. It seems like the Russians got this ship mainly so they could have a piece with a landing SA to fight the upcoming shore batteries of Set VI. 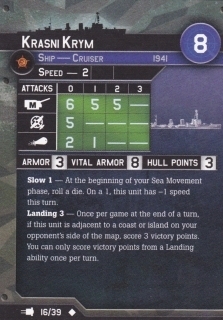 Ignore the fact that it says cruiser on the card. This is a destroyer that lacks ASW. Which means at 8 points Krym is horribly overpriced, get a Kirov or get a Gromkly they have their uses this doesn't it even has slow to handicap it further.